Taking the time to be part of a peer-mentoring group is something that we are sometimes given opportunity to do within academia. Quite often this is something which does not necessarily provide you credits and you are not allotted extra time for it. And yet some scholars decide to take part in those initiatives on their own accord – why is that? What do they feel they have gained afterwards? During the autumn of 2017, an email circulated asking for staff at the University of Helsinki who were interested in participating in Finnish- or English-speaking peer-mentoring groups for university teachers. This was the first time an English-speaking group had been offered. This paper is based on the experiences shared by this specific group. As part of a mentor-training programme, two facilitators (Tuomas Heikkilä and Eija Jokitalo) organised and led the peer-mentoring group meetings. The (peer-mentoring) group was not only an opportunity to share our experiences and to discuss our own ways of teaching and the possible difficulties we had been facing, but also an opportunity to learn from each other and to develop as teachers by using our joint practices (i.e., experiences, disciplines, and ways) as a foundation. From our very first meetings, it became clear that our group had a diverse range of knowledge, backgrounds, and experiences, based on the variety of countries we have lived, studied and/or taught in, as well as the variety of our disciplines. The group consisted of two Finnish facilitators and five group members representing four additional countries: USA (two members), Italy, France, and Sweden. In addition to the diverse countries of origin, we had studied and worked in different parts of the world, which further added to the combined international experience of the group. We, as a group, have studied in at least 12 different universities in 9 countries (Map 1). Most of us have studied and/or taught in different countries in Europe, Asia and North America. We have taught in upper secondary school and at university for Bachelor, Master and Ph.D. students, as well as post-docs. Map 1. 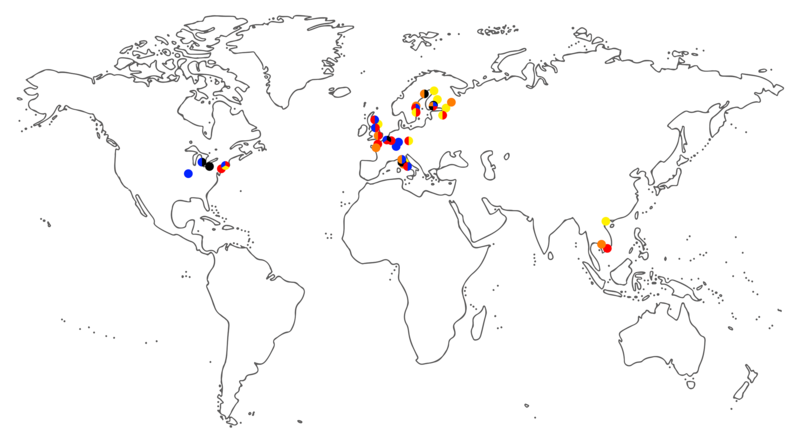 Map of towns where the authors were born (black dots), studied (blue dots), and have been teachers for over 1 year (red dots), for 3-12 months (orange dots) or in one-off courses (yellow dots). Figure by courtesy of Maro Järvinen. In addition to the vast experience in teaching, most of us have some formal training in university pedagogy. Our professional qualifications encompassed a wide range of academic disciplines and teaching expertise, enriching the discussions with a multitude of perspectives, which would sometimes differ and sometimes not. Together, we cover subjects including history, theology, linguistics, modern and ancient languages, textual scholarship, academic writing, biology, health, law, anthropology, and transferable skills. We consequently represent different academic faculties and departments within the University. As a way to continue our growth as teachers, we opted for a joint article with the scope to self-reflect and wrap up our ideas. After an initial meeting to introduce ourselves, the group moved on to discussing the qualities of a good teacher. We also decided on which topics would be most beneficial to us, in order to structure the topics of our following meetings. Our group had six formal meetings during the academic year. We decided that it would be best to focus on one topic per meeting: assessment (i.e., assessing the learning outcomes of the students) and evaluation (i.e., evaluating the teaching and the course); challenges and awkward situations in the classroom; classroom interaction; digital teaching tools (e.g., Flinga, Presemo, etc. ), as well as traditional teaching aids such as big sheets of paper, the board, Post-Its, etc. Each meeting lasted an average of two hours. The initial meetings were more structured, with more facilitator-led activities, but later meetings were increasingly based on the initiative of the group members, with facilitators participating in discussions as equals. The meetings were largely based on group discussion to address the pre-determined theme. Members of the group (including facilitators) also had the opportunity to present a sample lecture from one of their courses for feedback about teaching style, presentation, and so forth. Three members gave such teaching demonstrations. What have we gained from this experience? We all feel that this group is a valuable supplement to formal training and an important resource for international teachers at university. While it would be impossible to represent the entirety of our discussions here, a few examples can demonstrate the utility and benefits of participating in such a group, even as an experienced teacher. For instance, we discussed classroom interaction and how to encourage quiet students to interact. We were surprised by the similarity of ideas/activities we had, such as pairing students up to get them started and the use of group work to compare ideas and reflections. We also spoke about our different strategies and what worked well and not so well. Beyond comparing teaching and learning strategies, we took our time to think about situations we might stumble upon in the future. We then moved into discussing awkward situations and how sensitive topics can affect classroom interaction. The examples we provided enabled us to empathise more with the challenges that teachers from different disciplines may encounter. This raised awareness in each of us and allowed us to anticipate possible situations that we were not familiar with before. Next, we discussed evaluation and assessment. This general topic showed us that even the finer details of teaching, such as the terminology used within each discipline, could be interpreted in very different ways. This became quite clear through our attempt to use Flinga to gather our ideas on evaluation and feedback, and experiences on these two topics. We all had a preconception of what evaluation and feedback meant, but when we came together as a group, it became evident that we understood them differently. For instance, some of us understood evaluation as how we assess our students, while others understood it as how teachers are evaluated and still others thought it could be either. Following this discussion, we agreed that this work helped us in stepping out of our own discipline and formulating ideas and concepts in new ways that would be clearer to others. Overall, this group was an excellent supplement to more formal pedagogical training and provided us with the ability to fill-in training gaps that had not been addressed in our previous experiences, formal orientation programmes, or current offerings in our respective faculties for international teachers and researchers. By comparing our strategies and pooling our collective experience and background, we learned skills and strategies that we would not have otherwise learned on our own or necessarily even in formal training programmes. Thanks to this work, we appreciate more and more the importance of interdisciplinary work and cooperation. We felt that it worked well as a way of integrating international scholars. Furthermore, this type of group has the added benefit of making the locals / Finns in the group feel part of a more international community. The number of international students and staff members has long been relatively low at Finnish universities, but the universities are currently internationalising at a quick pace. This development emphasises the integration of international academic teachers and the interaction between them and Finnish-speaking staff. We find the international peer-mentoring groups to be a useful tool in both respects. Based on our experiences, we would like to encourage Finnish universities to offer English-speaking peer-mentoring groups and to encourage Finns to be involved in these groups as well, and not just in the Finnish-speaking groups. We do not want to be prescriptive in suggesting strict guidelines on how to organise such groups, yet we would like to conclude our discussion by listing some of the work we envision might be productive and foster a sense of community and cooperation. Every peer mentor group will be unique and will need to determine what its interests are and how best to work together as a group, including if the structure should be as relaxed and open as ours was or more rigid with more set tasks before each meeting. For the future, we suggest that such groups allocate more time per meeting and schedule social activities such as lunch for bonding, that facilitators consider introducing more focused questions on the group’s themes so that everyone could bring in prepared and concrete examples, and that the group should consider activities such as visiting each other’s lectures and contributing to a university-wide teacher’s blog. The groups could also contemplate occasionally inviting guest ’speakers’ to help fill a gap all members in the group feel they lack, or to stimulate discussion from outside expertise/opinions. We also see great potential in these groups to provide support for specific aspects of one’s teaching: from course and lesson plans to the lesson itself, as well as job material preparation (i.e., teaching portfolios and philosophies, as well as sample lessons for job interviews) and general concerns for international staff as they navigate the Finnish system, such as docentship and teaching assessments. On a more local level, we encourage the University of Helsinki to expand the peer-mentoring programme, but that groups should continue to integrate different faculties, and not be discipline-specific but rather maybe based on what works best when it comes to time and place. It might be a good idea to make the application such that one could indicate his/her preferences for time, place, etc. The current peer-mentoring programme is designed so that the groups only last for one academic year, but our group strongly believes that there should be an institutional framework for sustaining groups that want to continue into a second year or beyond. We also believe that groups should not be isolated events, but should be integrated into the larger university community and beyond (including nearby institutions) and should maximise their impact and outreach. The current option is that participants can become facilitators of another group, but there are no “second year” options at the moment. There is also currently no accreditation system to recognise participation in these groups. Even a modest recognition would likely encourage more academic teachers to participate in peer-mentoring. This type of group is an ideal forum for those staff members that are highly motivated and self-driven to improve and expand their teaching skill set. In our brief year together, we gained new insights and perspectives, ideas and concrete examples, and colleagues and friends. New seeds for improved skills and strategies and support have been planted, and we hope that they will grow within us and that the ideas of these groups will disperse across Finnish universities. https://flinga.fi. Flinga is an online platform for pedagogical activities. https://presemo.helsinki.fi. Presemo is an online classroom participation system designed to activate students.